Limited-time offer. 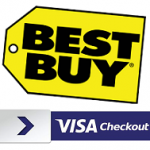 Valid online at staples.com® when you pay with Visa Checkout only. Not valid in store or on the mobile app. Limit one discount per customer, nontransferable. Discount is automatically applied to qualifying order when you select Visa Checkout and order is placed. Minimum purchase requirement of $100. Tax and shipping not included in calculating the minimum purchase. No cash/credit back. Not valid on SKU 513096, any Bose®, Canon® ink, Epson® ink and toner, HP ink and toner, JBL®, Roku®, Staples Industrial℠ purchases, Steelcase®, custom printing orders placed online, services, promotional products, gift cards, prior purchases or any purchases on other provider websites. Expires 4/09/2016 or when promotional redemption limit has been reached.